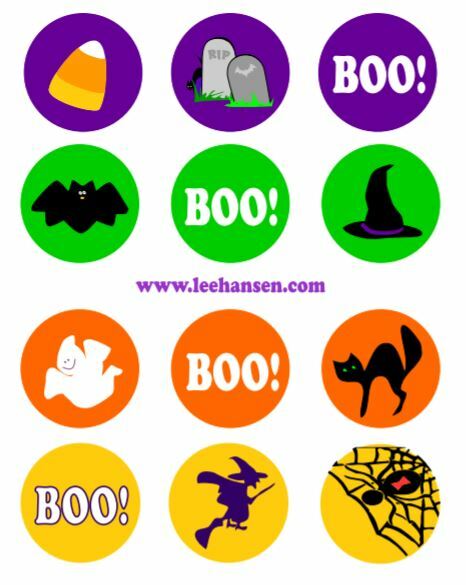 Free Printables: Halloween Stickers or Cupcake Toppers - Boo!, candy corn, witch hat, black cat, flying bat, gravestones, witch and spider in various Halloween colors all on one sheet. 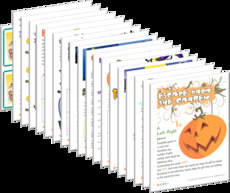 Printable Halloween sticker sheets are formatted in Adobe Acrobat PDF and print on 8.5" x 11" paper or self-adhesive sticker paper. Print a full sheet (8.5" x 11") on self adhesive paper or print, cut out and stick with glue stick or home made sticker glue. 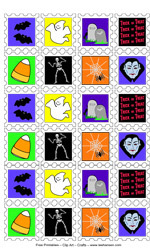 Click here to print a sheet of Halloween stickers like the design shown above - Adobe PDF format.